I am on a mission! 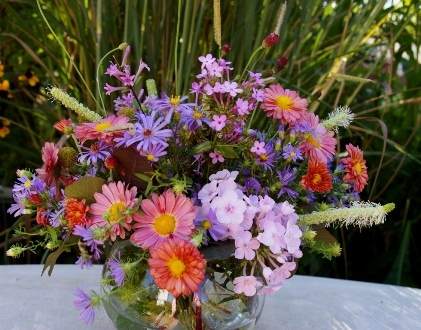 I want to inspire all of my readers to go out to the garden every week and pick flowers. I have been doing it for decades and it brings so much beauty to the inside of my house. brought to you by Aster laevis ‘Bluebird’, Aster oblongifolius ‘October Skies’, Phlox paniculata ‘Jeana’ (tons of tiny pink florets in center), Phlox paniculata ‘Tracy’s Treasure'(pale pink in front), ‘Coral Daisy’ Mammoth mums, Sanguisorba tenuifolia (burgundy red spikes) and canadensis (white spikes, native), purple smokebush foliage, Leptodermis oblonga (tiny purple trumpet flowers in top left of arrangement), and ‘Blonde Ambition’ ornamental grass. I picked all of these in my gardens at home and at Natureworks today! Just so you can see the potential of some of these awesome fall perennials, the Aster oblongifolius ‘October Skies’ shown in my garden above is over three feet across and covered with thousands of flower buds. 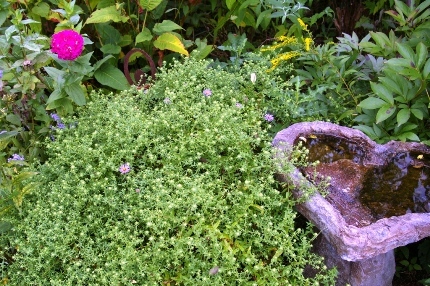 It will bloom before Aster ‘Raydon’s Favorite’ which is similar. Both were planted in the fall as small starter plants only a few years ago. I love this time of year! This entry was posted in Blog, For App, Weekly EMail. Bookmark the permalink. Fall Planting Season Has Arrived! Bulbs for Breast Cancer Fundraiser is THIS WEEKEND!